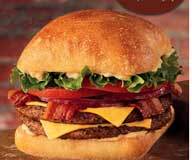 When I saw a television commercial for the new Ciabatta Burger at Jack In The Box, I was very skeptical. I am a traditionalist, and don’t think that a hamburger should have a bun made from fancy ciabatta bread (Sidenote: However, I did recently eat the Skippy Burger at Hamburger Mary’s in Sacramento. That’s right – a burger topped with Skippy peanut butter!). After eating the Bacon ‘n’ Cheese Ciabatta Burger, I’ve changed my mind. The burger is great, and the ciabatta bread bun is very tasty and is a nice change from the typical hamburger bun. The smoky cheddar mayonnaise also helps to make this burger better than most. Jack has done it again – go get yourself a Ciabatta Burger. Taco Bell’s new Crunchwrap Supreme is a great idea that seems like it would work well, but instead disappointed me. The Crunchwrap Supreme is a tostada shell with meat, nacho cheese sauce, sour cream, and some rabbit food (tomatoes and lettuce…) all wrapped in a tortilla and grilled. It has all the components needed to taste great – so why didn’t I like it? First, it suffered from a limp tostada shell that had no crunch at all. Second, it was grilled too much, giving it a nasty, burnt flavor. I’ll probably try it again, just in case the person who made my Crunchwrap Supreme was having a bad day. I hope the next one is better. A co-worker was raving about these new Pepperidge Farm Soft Baked Snickerdoodle Cookies the other day. Being a snickerdoodle connoisseur, I knew I had to give them a try. These cookies do not taste like any other snickerdoodle I have ever had. They are much darker, with a strong molasses-like flavor – a lot different than the light golden color and cream-of-tarter flavor that I love I'm used to. They are also much too chewy, in my opinion. The cinnamon and sugar covering the cookie are the only things that even make me think that it is a snickerdoodle. Hey, Pepperidge Farm – you guys should have hired me as a consultant when developing this cookie. I would have told you how a snickerdoodle really should be. 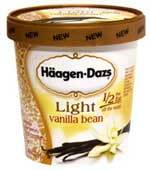 Häagen-Dazs has introduced a new line of “light” ice creams. I recently bought a pint of Vanilla Bean and was very anxious to see how it tasted. Häagen-Dazs has done a good job creating a high-quality ice cream that has 50% less fat and 21% less calories than their regular ice cream. The texture is smooth and creamy, just like it should be. I think the vanilla has a hint of that “artificial” flavor, but the ingredients lists only “natural flavor” and “vanilla bean flakes.” Could have just been my taste buds were a little off that night. Overall, it is pretty good and I will definitely buy it again. There are six other flavors, including “s’mores,” which I must try. I’ve always loved Fruity Pebbles cereal but don’t eat it very often due to the high sugar content. Now, I can enjoy them more often as Post has introduced a low-sugar version. Although I didn’t have a bowl of the original version to compare it to, I have to say that Half the Sugar Fruity Pebbles look and taste so close to the original that you will never tell the difference. They are great! And, they have less sugar than my usual (semi-healthy) cereal, Life. Go get yourself a box today.